Great shot! Reminded me of a hill station we put up ourselves last summer. Where did u take this shot? Les Says: This was taken here in Sault Ste. 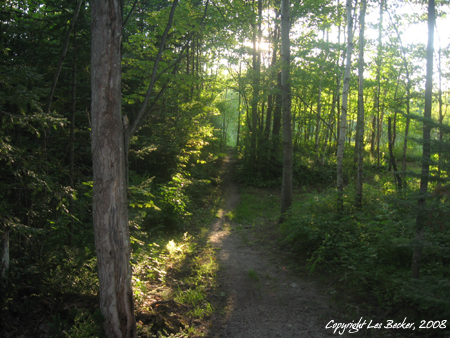 Marie, Ontario, Canada, on a series of paths through the woods [or “the bush”, as we Northern Ontarians call the woods – 😉 ] in an area known as Fort Creek. I’m glad you like the shot, Deepak, and hope you continue to come by. looking at the green trees always brings peace in mind. Les Says: I’ve added the description to this shot. I’ll have to go back and do the same for the rest a little at a time. Thanks for the visit, Panji – hope you visit again! peaceful indeed. the trees and woods always provide us a sense of peacefulness, and i love your shot. Les Says: Thank you, Betchai. I hope to see you here again. Les Says: It is, isn’t it, Paula? We love hiking here. Thanks for coming by! Hope to see you again, soon.